Turmeric for Pain Relief: Can It Help? When it comes to taming pain, a natural remedy known as turmeric may help you find relief. Available in supplement form, extracts from turmeric’s stems contain compounds that may possess pain-reducing properties. Perhaps best known as a key ingredient in curry powder, turmeric has long been used in Ayurveda approaches to treat a wide range of health troubles. These include a number of pain-related conditions, as well as issues such as fatigue and respiratory problems. Sometimes referred to as Indian saffron, turmeric contains a compound called curcumin. Research shows that curcumin may reduce inflammation, which may help to alleviate pain. It should be noted that most of the studies testing the pain-relieving effects of turmeric have focused on the treatment of osteoarthritis and/or rheumatoid arthritis. You can learn more about using turmeric to treat arthritis pain here. Curcumin may help lessen the severity of symptoms associated with premenstrual syndrome (PMS), according to a study published in Complementary Therapies in Medicine in 2015. These symptoms include several forms of pain, such as backache, headache, breast tenderness, and abdominal pain. For the study, 70 women with PMS were split into two groups. One group received two capsules of curcumin daily for seven days before menstruation and for three days after menstruation for three successive cycles, while the other group received a placebo for the same time period. By the study’s end, those given the turmeric compound showed a greater reduction in the severity of PMS symptoms. In a study published in the Journal of Oral Rehabilitation in 2018, scientists found that curcumin may help relieve the pain associated with post-surgical removal of impacted third molars (i.e., “wisdom teeth”). 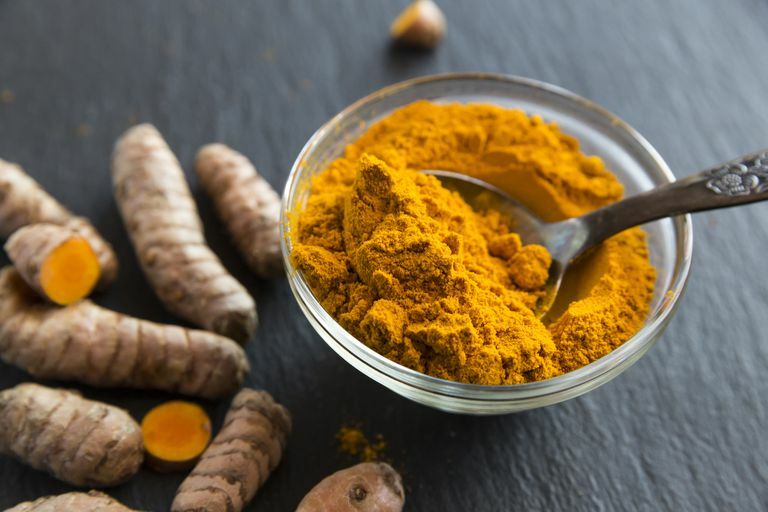 The study involved 90 participants, each of whom received either curcumin or mefenamic acid (a nonsteroidal anti-inflammatory drug) after undergoing surgery. When the two groups were compared, those given curcumin were found to have experienced significantly less pain than those treated with mefenamic acid. Curcumin shows promise in the treatment of tendonitis, a painful condition marked by inflammation or irritation of a tendon. That’s the finding of a study published in the Journal of Biological Chemistry in 2011, for which researchers examined curcumin’s effects on human tendon cells. Results revealed that curcumin may stave off pain by preventing the activation of certain inflammatory molecules. Although turmeric is generally considered safe, there’s some concern that high doses of turmeric (or using turmeric in the long term) may trigger gastrointestinal problems, such as nausea, dizziness, and diarrhea. Furthermore, use of turmeric may aggravate gallbladder problems, slow blood clotting, and/or lead to dangerously low blood sugar levels in people with diabetes. If you have a chronic health condition (or if you’re planning to undergo surgery), it’s crucial to talk to your doctor before using turmeric supplements. More research is needed before turmeric can be recommended for any type of pain relief. However, it’s possible that including turmeric in your diet may have a positive impact on your overall health. To that end, turmeric may boost your wellbeing by offering antioxidant benefits, in addition to curbing inflammation. To increase your turmeric intake without using dietary supplements, try adding curry powder to your stir-fries, soups, and vegetable dishes. You can also consume turmeric in tea form. Buhrmann C, Mobasheri A, Busch F, Aldinger C, Stahlmann R, Montaseri A, Shakibaei M. Curcumin modulates nuclear factor kappaB (NF-kappaB)-mediated inflammation in human tenocytes in vitro: role of the phosphatidylinositol 3-kinase/Akt pathway. J Biol Chem. 2011 Aug 12;286(32):28556-66. DOI: 10.1074/jbc.M111.256180. Gupta SC, Patchva S, Koh W, Aggarwal BB. Discovery of curcumin, a component of golden spice, and its miraculous biological activities. Clin Exp Pharmacol Physiol. 2012 Mar;39(3):283-99. DOI: 10.1111/j.1440-1681.2011.05648.x. Khayat S, Fanaei H, Kheirkhah M, Moghadam ZB, Kasaeian A, Javadimehr M. Curcumin attenuates severity of premenstrual syndrome symptoms: A randomized, double-blind, placebo-controlled trial. Complement Ther Med. 2015 Jun;23(3):318-24. DOI: 10.1016/j.ctim.2015.04.001. Maulina T, Diana H, Cahyanto A, Amaliya A. The efficacy of curcumin in managing acute inflammation pain on the post-surgical removal of impacted third molars patients: A randomised controlled trial. J Oral Rehabil. 2018 Jun 16. DOI: 10.1111/joor.12679. Gupta SC, Kismali G, Aggarwal BB. Curcumin, a component of turmeric: from farm to pharmacy. Biofactors. 2013 Jan-Feb;39(1):2-13. DOI: 10.1002/biof.1079. Can Ginger Ease Arthritis Pain? Can Arnica Help With Pain and Bruising?